It may seem strange, even for you the reader, to say that Caribbean vacations, specialty spa resorts and skiing in Colorado are all getting old and boring. Perhaps a fitness vacation could be in order to spice up your old vacation habits. If you have thought about this already, you are among many others who feel the same. With all the pressure for us to become and remain fit, thousands are now taking their vacations to a whole new level. Destination fitness vacations are the latest rage, and here you will see why giving them a shot could be the best thing you have ever done. Here are some amazing fitness vacation destination hot spots. Located in northern Italy, Cinque Terre has gained popularity over the last decade and is one place that must be considered if a fitness vacation is what you’re after. There are 5 towns or “lands” as most refer to them that make up the Cinque Terre: Riomaggiore, Manarola, Corniglia, Vernazza and Monterosso. Each of these lands or towns has something to offer in the way of nightlife, wineries, museums and lots of historical sites. Enjoy a nice meal in any of the quaint town’s waterside or embark on a scuba or diving expedition. Also there is the infamous walking trail which is 11 Kilometers long in total. 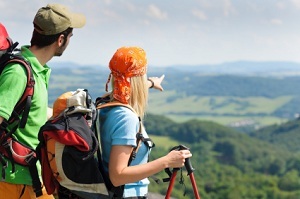 Throughout the hiking path there are many challenges to be met for the fitness enthusiast. If you have your heart set on a cruise but still want a vacation that is active, Crystal Cruises are a great choice. On board guests can enjoy a state of the art gym, many holistic classes like Yoga and Pilates or take a jog on the boat’s top track while viewing the sea and enjoying the breezes. The menu aboard this cruise line is packed with nutritious meals and snacks and the ship makes plenty of pit stops along the way so you can still enjoy shopping, a cocktail or dining when you need a break from getting fit. Perhaps the only thing that could make a vacation to Mexico better is a fitness buff embarking on their Amansala vacation. The most popular one here is referred to as a “mini boot camp” and it isn’t for the faint of heart. This vacation will not only teach you how to get your body in tip top shape, it will give you a powerful kick start. Activities include all kinds of body sculpting classes, classics like Pilates and Yoga, kayak sessions and abdominal classes. Once your workouts are done, enjoy sunbathing on the beach and eating one of their many low-fat meals specially designed to not interfere in your weight loss goals. This entry was posted in News Magazine and tagged fitness, fitness destination, spa resorts, vacation on November 1, 2012 by admin.